The era of kings is past, but the curiosity about them is still even today. We are very interested to know about their royal moods, entertainment, hobbies, freak etc. And still interested in knowing about those events. Every story of this book as alive by the touch of author pen. 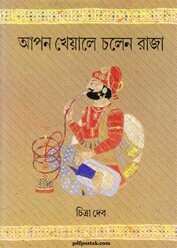 The book not only described the words of the local princes but also mention of Mughal emperors, Hindu kings and Nawab and the rich wealthy people who called Raja. Different aspects of life and diversity of their, these are the main topics of this book. There are many mind blooming sketch in this book.